Originally settled by horse ranchers in the 1950’s and 1960’s, the Cactus Corridor neighborhood of Scottsdale, Arizona is now a rural oasis in the center of the city’s urban sprawl. Over the years, this neighborhood has retained its old-fashioned charm by working with the City of Scottsdale to create zoning measures, ensuring that the traditional character will be preserved for years to come. The Cactus Corridor neighborhood contains a variety of single-family homes ranging in size from 2,500 to over 10,000 square feet. The variety of styles offered in Cactus Corridor creates an established feel, and the updated and restored older homes provide character not found in most subdivisions, making this area highly desirable. Homebuyers interested in Cactus Corridor real estate options will also be pleased with its broad price range of $299,000 to $2.5 million, which ensures almost all buyers are sure to find a home to suit their tastes and budget. 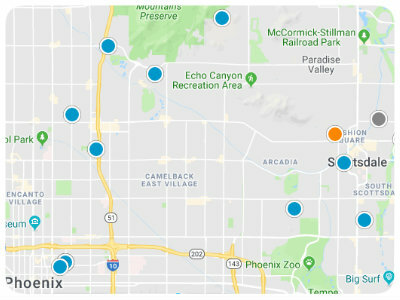 While the rural charm of this area draws many homebuyers, the location also provides residents with easy access to the many impressive amenities of Scottsdale. Cactus Corridor falls within the highly rated Scottsdale Unified School District, and is only 15 minutes from the heart of Downtown. With the Scottsdale Airport, shopping and dining, multi-use outdoor trails, and a host of public and private golf clubs just minutes away, it’s easy to understand why this remarkable neighborhood is such a popular place to buy a home. If you would like to buy a home in the esteemed neighborhood of Cactus Corridor in Scottsdale, Arizona, please do not hesitate to contact us today!